One of my favorite snack food bars, Banana nut bars from odwalla suddenly were out of stock everywhere for 2 months or so. And I started snacking on nuts on the road or everyday snack time. Too many nuts and me do not go well together. Breakouts and jiggly arms. nuff said. So I decided I needed to make some snack bars. 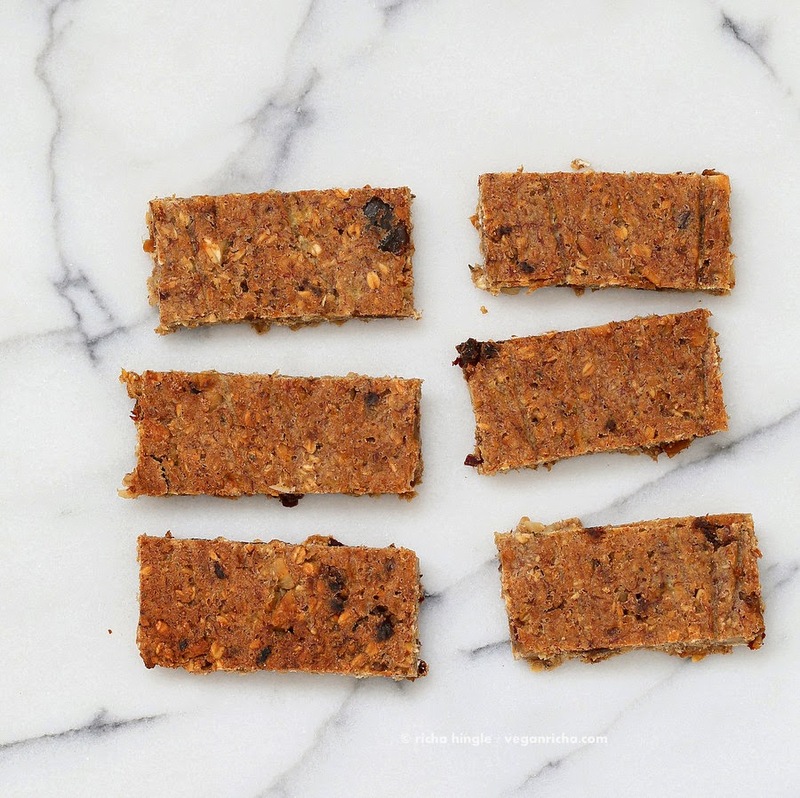 So here are these snack bars. Bananas, Oats, Dates, walnuts, cashews, hemp, spices. done. Make a batch and keep these handy. I kept these very simple. You can add in other dried fruit like cherries, apricots, strawberries, blueberries etc. Add other seeds and nuts. 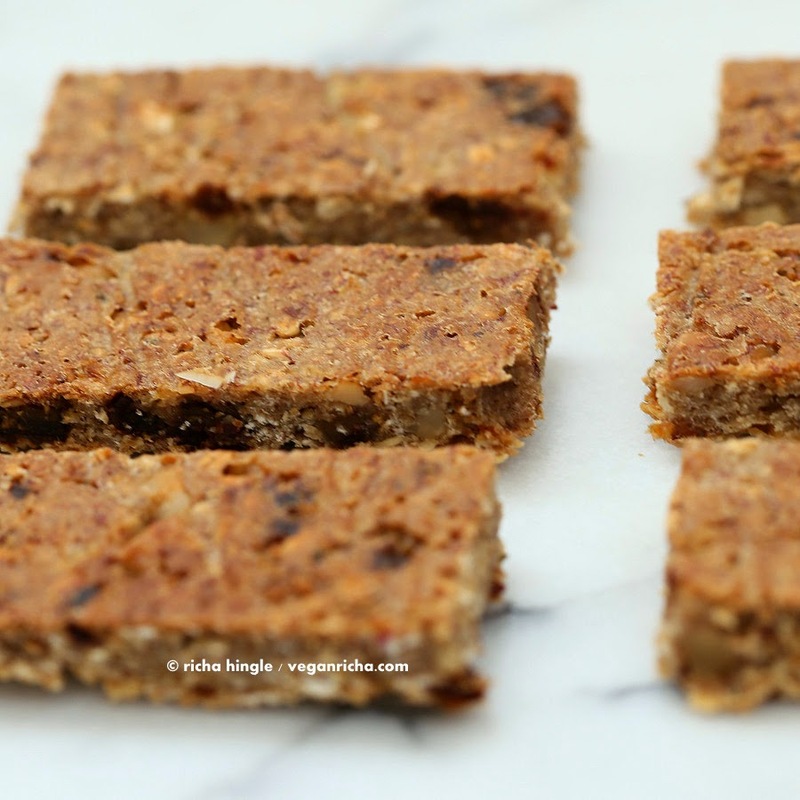 These granola bars are refined sugar free, can be made oil-free. In a bowl, mash the bananas and mix in the vanilla, salt, cinnamon, cloves, nutmeg and oil. In a food processor, add oats, walnuts, dates and hemp seeds and pulse to make a coarse mixture. you can keep it chunky by adding chopped nuts later. Add this to the banana mixture a cup at a time and mix. Add more oats if needed. Press the mixture onto parchment lined sheet into a 1/4 inch thick rectangle. Bake for 20 minutes. Rotate the baking sheet and bake for another 7 to 10 minutes or until golden on the edges and dry to touch in the center. Let cool completely before slicing. Store in the refrigerator for upto a week or freeze. Use other dried fruit like cherries, apricots, strawberries, blueberries etc for variations. Oh, this looks so tasty! Are the hemp seeds just there for nutrition (as opposed to binding)? Could I do half flax seed, half hemp? sure use any seeds or nuts. the banana binds everything. Hey Richa ..nice recipe!! I wanted to know if there is any alternate ingredient for oats. Oats doesn’t suit me. Thanks. 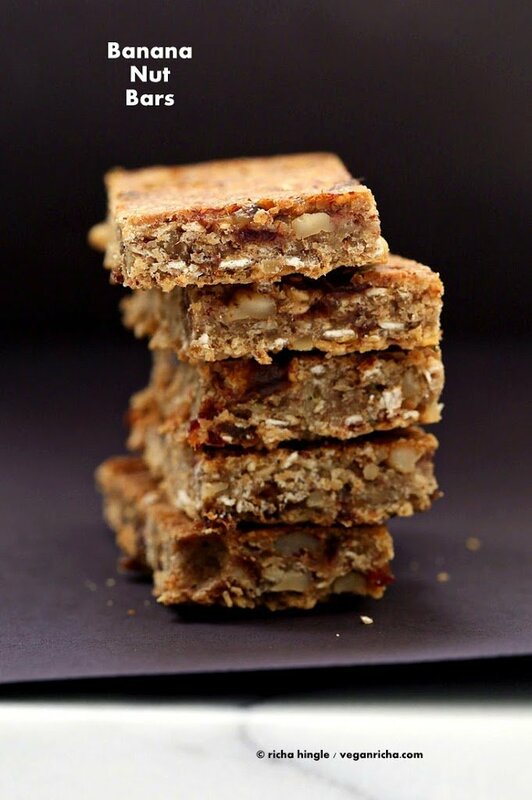 You can add dried coconut flakes, more of the nuts and seeds and some flour of choice. Add enough so the mixture is stiff not too sticky mix. then press into a parchemnt lined sheet or pan and bake. So perfect snack. Especially for people on diet who must eat something sweet but still healthy. There is also great idea for people who don’t have time to eat breakfast at home. They can buy only some yogurt or milk and nutritious breakfast is ready. Your recipe give us also vitamin B1 and B6, for more nutritional information you can chech HappyForks analyzer. I was an Odwalla bar FIEND for a long time, but I think I’ll take yours over theirs any day! We made these for breakfast and loved them. Didn’t have hemp seeds so just added some ground flax. banana and nuts are just the best combination. jumbo sized banana nut muffins were my favorite growing up- these are the perfect healthy alternative! Can you clarify where to use the 2 tsp coconut oil. Thanks! Thank you so much!!!! I have a batch in the oven now. I cannot wait to try them. They smell yummy. Try it with rice flour. Make a smaller batch to see how it does and if you like the texture and taste. chickpea flour will make it taste beany and bitter. Just made these and they are delicious! What I love about your recipes, besides the tastiness and healthiness, is the flexibility – if I don’t have an ingredient it still works to sub another – this time I subbed flax seed for hemp seed. Hi Richa, thank you for all of your great recipes. I have this in the oven now and am looking forward to it! I am also looking forward to your cookbook! Do you by chance have an option that uses quinoa rather than oats? Can quinoa (cooked or uncooked) be substituted? you can use toasted or cooked quinoa. 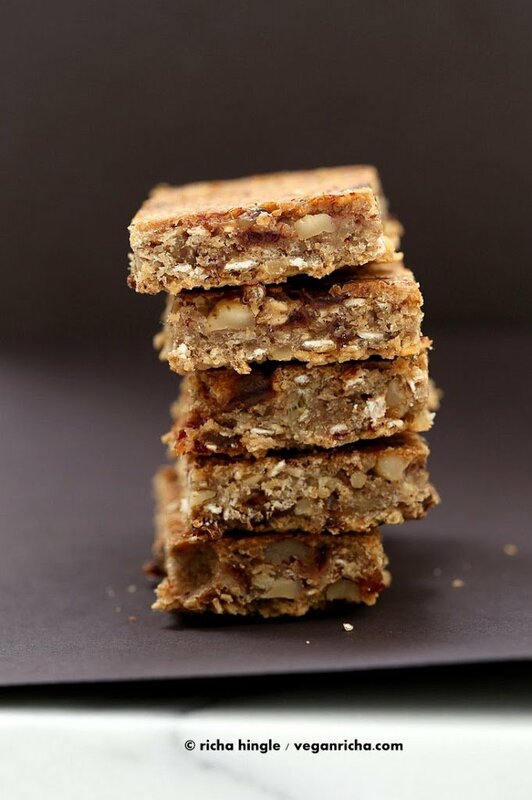 with cooked quinoa, store the bars in the refrigerator for upto 5 days. I made this yesterday and the flavors are great but it’s more chewy biscuit than moist brownie. yes it is chewy depending on how long it is baked. to make it biscuity, add some balking powder.